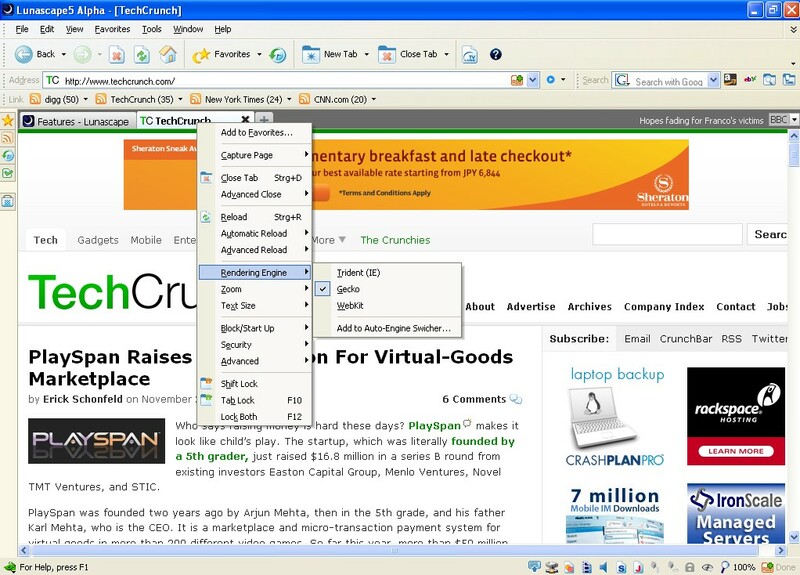 Lunascape 5 is an interesting alternative for people (like me) who primarily use Firefox but keep Internet Explorer as a second browser when they encounter rendering problems (i. e. on some of the few IE-only and IE-optimized web pages out there). This is how Lunascape works: Users can toggle between rendering engines by either right-clicking tabs or by clicking on the engine switcher button on the bottom left of the screen. If you have figured out which engine works best for a page, Lunascape lets you force the page to use that engine for future visits via a pull down menu (Lunascape CEO Hidekazu Kondo calls this “semi-automatic” engine switching). I tested Lunascape 5 for some hours now and apart from a few bugs (under the Gecko engine, saving a picture prompted a Japanese confirmation box, for example), it’s pretty stable. 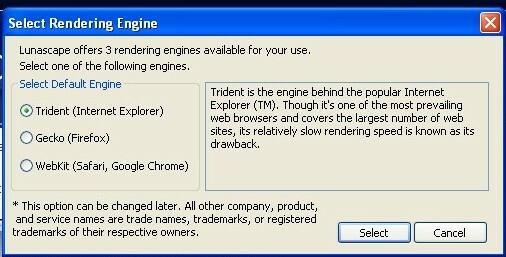 The browser is mainly appealing to geeks and web developers. It comes with an abundance of features: Native support for RSS and podcast feeds, tab crash protection, support of mouse gestures for easier navigation, a library of Lunascape-exclusive plug-ins (Japanese only at this point) and skins, a form auto saver (which saves passwords and texts written in blog posts or webmails) and a huge number of tweaks and settings in the default menus. Unfortunately, the alpha version is currently not supporting Firefox add-ons (although IE add-ons do work). At this point, the browser isn’t automatically able to recommend to you which engine works best for which page, a feature that might be integrated into future versions. But Lunascape is still in alpha phase so it being a little rough around the edges is acceptable. Kondo promises an improved beta version to be released “very soon” and hopes for feedback from international users in particular. The company says the Japanese version of Lunascape has been downloaded 10 million times since 2004 and wants to capture a 5% share of the global browser market. (Get in line). In order to step up efforts to promote the browser outside of Japan, Lunascape has established a subsidiary company in San Jose in June of this year.